You don't usually expect to find a lake on top of the Santa Cruz Mountains, but that's what's there if you stop at the Alpine Road parking lot off Skyline and walk under the tunnel. If you avoid the quail and the rabbits, you'll find it, in a hollow in the hills. There the pines fold down the mountainside, and the bull rushes stand tall. It's a quiet place, a peaceful oasis from the hustle and bustle of Silicon Valley. The sun was setting when we arrived there last Saturday. 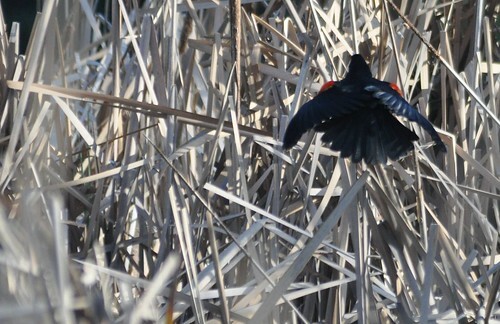 In the distance we could hear the buzzing and whirring of red-winged blackbirds. As we walked around the lake the noise got louder and louder, and there they were, three males, their red shoulder pads flickering in the evening sun as they tried to attract the hidden females. We managed to get close to one, its tail feathers spread wide, as it tried to out-dance the other birds.